Holland America Line’s new Ryndam will be similar to sister ships Koningsdam and Nieuw Statendam. 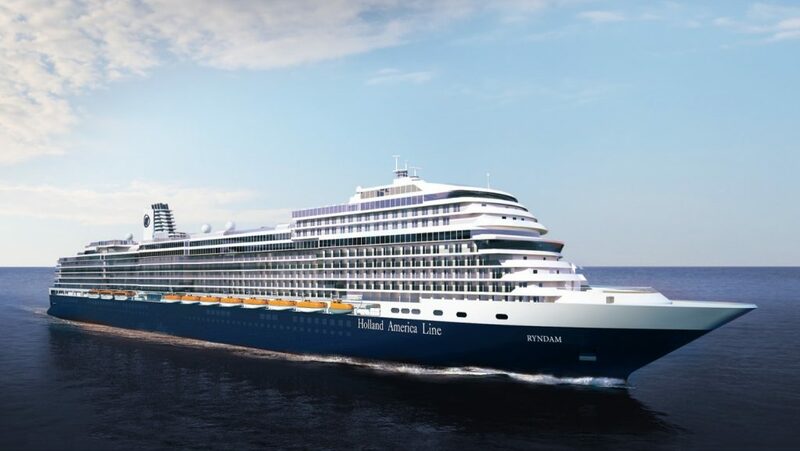 As the third ship in the series, Ryndam will feature enhanced Pinnacle Class amenities and innovations, along with Holland America Line hallmarks that drive one of the highest guest repeat rates in the industry. The new Ryndam will include popular Pinnacle Class innovations such as Rudi’s Sel de Mer; the World Stage, with two-story, 270-degree wraparound LED screens for immersive main stage performances; and the best live music at sea in Music Walk with Lincoln Center Sage, B.B. King’s Blues Club, Billboard Onboard and the new Rolling Stone Rock Room. Other featured hallmarks of the premium brand include wrap-around teak decks, luxurious staterooms, a stunning artwork collection and award-winning cuisine ranging from casual to fine dining. As with sister ships Koningsdam and Nieuw Statendam, Ryndam will feature exquisite public spaces and its own style created by leading hospitality designer Adam D. Tihany and designer and architect Bjørn Storbraaten. Grand, light-filled spaces will create visual drama while the sumptuous interiors will be inspired by the fluid curves of musical instruments. The new Ryndam will weigh 99,500 tons and carry 2,666 guests. The ship is scheduled for delivery in May 2021.